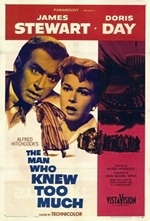 The Man Who Knew Too Much is a 1956 suspense thriller film directed by Alfred Hitchcock, starring James Stewart and Doris Day. The film is a somewhat altered remake in widescreen VistaVision and Technicolor of Hitchcock's 1934 film of the same name. In the book-length interview Hitchcock/Truffaut (1967), in response to fellow filmmaker Francois Truffaut's assertion that aspects of the remake were by far superior, Hitchcock replied "Let's say the first version is the work of a talented amateur and the second was made by a professional." The film won an Academy Award for Best Song for "Whatever Will Be, Will Be (Que Sera, Sera)", sung by Doris Day. It was also entered into the 1956 Cannes Film Festival.